Chocolates have always been loved and romantically driven the taste of everyone in every occasion. 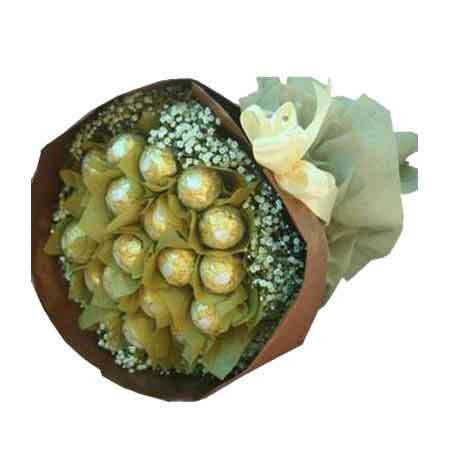 Flower & Cake gallery presents a unique gift and treat of sixteen pieces of ferrero rocher bouquet in brown paper packing with ribbon bow for all chocolate lovers. Order it online to see the real charm of it in various occasions like birthdays, valentine days, anniversaries, etc. An extra ordinary set of gift that not only looks good but also tastes marvelous. Suitable to be gifted on all merry occasions like birthdays, valentine days, corporate parties, etc. this delighting treat includes heavenly tasting 16 pieces of ferrerorocher in brown paper packing with ribbon bow.